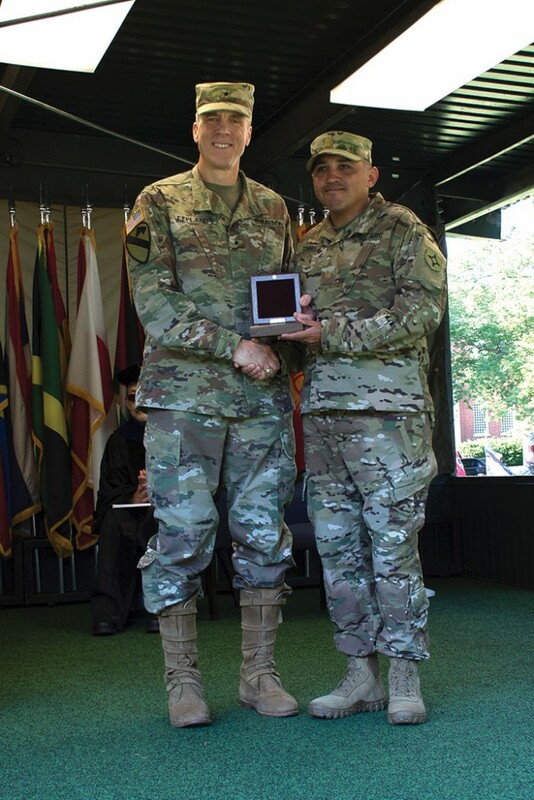 Florida Guardsman earns CGSC's Pershing Award | Command and General Staff College Foundation, Inc.
On June 15, 2018, Maj. Oscar Torres, a Florida Army National Guardsman from Lakeland Florida, received the General John J. Pershing Award during the graduation ceremony for the U.S. Army Command and General Staff College Class of 2018 at Fort Leavenworth Kansas. Torres is the battalion operations officer for the 146th Expeditionary Signal Battalion (ESB). Army University Provost and Deputy Commandant of the Command and General Staff College, Brig. 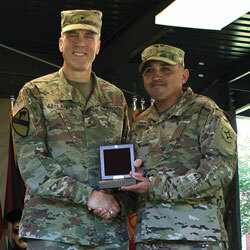 Gen. Scott Efflandt presents the Pershing Award to Maj. Oscar Torres as the outstanding student graduate in the CGSOC’s Department of Distance Education. The General John J. Pershing Award is awarded to the outstanding student graduate in the Command and General Staff Officers Course (CGSOC) Department of Distance Education (DDE). The award is based on the whole student-officer concept, accounting for general performance and participation in all course work. 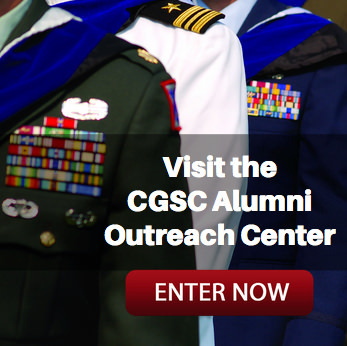 To qualify, a student must possess a minimum cumulative grade point average of 3.8 in both the Common Core and Advanced Operations Course (AOC); demonstrate leadership and excellence; receive no block grades below “A minus” (A-) in any block of CGSOC distance education; meet Army physical fitness and weight standards for nominations. The award itself has two elements: a gold plated medallion with a raised-relief bronze of the College crest, and an engraving with the name and class of the distinguished graduate. The award is presented during the CGSC graduation ceremony at Fort Leavenworth. Torres participated in the CGSOC graduation ceremony for the class of 2018 alongside more than 1,100 mid-career officers from all American military services as well as 119 international officers representing 91 countries and 24 federal government civilian employees. His wife Brooke, his son Tyler, and his mother Maria proudly attended. Most impressively, during his enrollment in CGSOC, the state of Florida was hit by category five Hurricane Irma. As a member of the Florida Army National Guard and the operations officer for the 146th ESB, Maj. Torres was activated and deployed as part of the relief response. 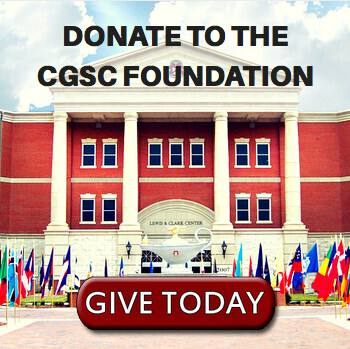 He distinguished himself not only by fully executing his duties with the Florida Army National Guard, but also by continuing to serve as staff group leader in his CGSOC studies. According to his professors in the DDE, Torres’ example of leadership, dedication and selfless service is why his fellow staff members consistently rated him the highest on every peer assessment. Major Torres academic and military accomplishments are easy to understand if one considers his background and character. He was brought up in a hardworking agricultural family where he worked after school and on weekends as a youth to contribute to the family. He took that work ethic with him into adulthood and the military, when he enlisted in the Army in 1994 and become an officer in 2004 through the Florida Army National Guard Army Officer Candidate School program. In 2007 he became the first in his family to graduate from college, earning a bachelor’s degree in information technology from the University of South Florida. He worked full time and went to school for eight years in order to graduate, and in 2012 earned his master’s degree in information technology from Webster University. Within his community, Maj. Torres supports multiple organizations such as High Risk Hope, Noah’s Ark of Central Florida, Salvation Army, and Habitat for Humanity. The trustees and staff of the CGSC Foundation congratulate Maj. Torres for his outstanding performance in CGSOC. The Foundation invites him and all other graduates to join the Alumni Association Program to remain connected to each other and the College.